Like last year, we will be holding open weekends to record gravestone inscriptions/monumental inscriptions in cemeteries and churchyards. Saturday 27th and Sunday 28th August at Lilliesleaf, Roxburghshire, TD6 9JD. In each case, we will probably work from 10am to 4pm on the Saturday, and 1pm to 4pm on the Sunday. Even if you have not been involved in transcribing stones before, do consider joining us, as training can be given. Everybody who took part last year thoroughly enjoyed themselves. You’ll need a notebook and a pencil and also it can be helpful if you have a soft brush, chalk, water spray and a kneeling mat. Most people coming for the whole day bring along a picnic, and a bottle of water; deciphering faded and weathered inscriptions can be thirsty work. If you want to come but don’t have transport, we may be able to arrange a lift. 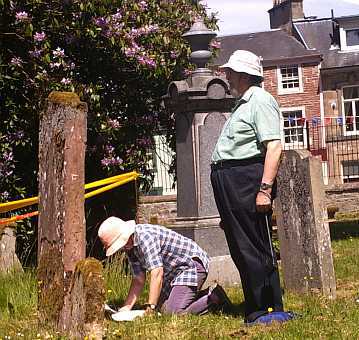 If you would like to take part in any of the events on one or both days, even for a few hours on either day, please contact our organiser, Ronald Morrison either on 01361 882166, or via our Contacts page, using the contact type Gravestone Recording. This will allow us to coordinate the work, confirm to you more precisely what is involved and advise in the event of any change in the arrangements.